Amitabh Bachchan's only brother and sister-in-law Ajitabh and Ramola say the public perception of the superstar as a kind, loving father and gentleman is both accurate and richly deserved. In a rare media interview on the eve of his brother's 60th birthday, a delighted Ajitabh told rediff.com how he had contributed to a book of photographs and to a film that are being released for the occasion. "He has had a very long, steady career. He has done well in films or television or the stage or live shows," says Ajitabh who lives with his wife and children in London's exclusive enclave of Hampstead. "With Amitabh, it is also a national thing. He is everyone's brother, father, son." The two brothers live thousands of miles apart. Ajitabh has been a resident of London for the last 15 years. But they are in regular and friendly contact. Although Amitabh often stays at a hotel when he visits London, he also always takes time out to touch base with his younger brother's family to renew and strengthen the family contacts he holds so dear. The Bachchan brothers were born in pre-Independence Allahabad and were sent to boarding school at Sherwood College, Nainital, in 1956 after their father was nominated to the Rajya Sabha. They are sons of one of India's best known Hindi poets, 96-year-old Harivanshrai Bachchan, a PhD from Cambridge University, UK, where he did his doctoral research on poet W B Yeats. His sons were born after he returned to India and took up a job teaching English Literature at Allahabad University. The boys' names were chosen by Harivanshrai's best friend at the time and fellow poet, Sumitra Nandan Pant. "He was a godfather figure," recalls Ajitabh. "The names that were chosen for us are Bengali names. Amitabh means the light that cannot be extinguished. Ajitabh means the light you cannot conquer; it also means the sun. The Cambridge and Allahabad connection explains the Bachchan family's lifelong friendship with the Nehrus. This is a subject that Ajitabh does not wish to discuss, although he acknowledges that [late Prime Minister] Indira Gandhi did rush to his brother's hospital bed when he was critically ill when he was injured on the sets of Coolie in 1983. For Ajitabh, the most significant gift from his father and mother Teji has been the happy atmosphere they created at home. Some of that happiness rubbed off on the boys, helping forge an unbreakable bond of friendship between them. "Of course, we looked after each other at school, but there was a five-year difference so we hardly knew each other at school," says Ajitabh. "By the time I came out of school, Amit had already left college. Still, we were good friends even though we were so many years apart." After school, the brothers ended up in Kolkata, looking for suitable employment, and then Mumbai. 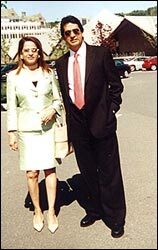 Much later, Ajitabh left for London with his family. A devoted fan of his elder brother's films -- Sholay and Deewar are his favourites -- Ajitabh remembers how his brother was always in the school's English language plays. But all the Hindi diction and recitation for which Amitabh is so famous came from their father. Amitabh, then a shipping executive in Kolkata, found a bride for his younger sibling. He and Ramola had been sincere friends for a few years. He then introduced her to Ajitabh. Ramola has happy memories of the days she spent in Kolkata as a guest of both Amitabh and Ajitabh. She says, "My friendship with Amitabh goes back to before he or I got married and even before I met Ajitabh. Amitabh was working in Kolkata in his pre-film days. We moved in the same circle and were very good friends. It was through him that I met Ajitabh. "It was pure friendship. This was in the 1960s before he had thought of joining the films. I think he had a secret yearning for films, but it was not prominent then." Describing her brother-in-law as a decent human being who always remembers birthdays and anniversaries, Ramola adds, "We have been out of India for a while, but whenever Amitabh is in London or whenever we are in India we see a lot of him. "He is primarily a family man," continues Ramola. "His commitments to his family are of the greatest importance to him. That is how I know him. I know him as a family man, a loving family man. He is very good at remembering special family occasions. In spite of his very busy life he never fails to remember family occasions. He calls us and wishes us from wherever he is. "Our children get on with him very well. They know and respect him as their uncle but they also have a very informal relationship with him. He has the capacity of coming down to their level, chatting with them, having fun with them." Ramola watches every one of Amitabh's films. Her best memory is of Amit as an angry young man in films like Zanjeer, Deewar and Muqaddar Ka Sikander. "My favourite is Amar Akbar Anthony because l think you see a bit of everything of Amitabh in that film. That is the best memory I have of him. He does comedy, he does action, he does emotion, you see a bit of everything." Asked whether she can explain Amitabh's ever strong popularity with film goers, Ramola says he was always a hero in the minds of the public. "The celluloid image and his personal image fused when he had his big accident [on the sets of Coolie] in 1982. He was critically ill and became a personal treasure for the country. "It would be very presumptuous of me to pass a judgement on him as an actor, but I would agree with the general opinion that he's an actor par excellence and has a very varied repertoire. He can do the hardened criminal, the loving father, the romantic, the comedy." As Amitabh's bhabhi (sister-in-law), Ramola expects to play a special role in the celebrations for his birthday. "I will not give away any secrets. But a 60th birthday demands something very special."